Ann Yarmal is a gifted and courageous poet who left the security of her job in Connecticut and joined the Peace Corps to serve in the Eastern Caribbean. This book is a distillation of her experience on both sides of the economic and cultural divide. It is an essentially hopeful book. It holds the promise of a future by attending deeply to the entire spectrum of our present moment as it shifts continually between darkness and light. Ann Yarmal has ears to tune language to her own hard, sculpted cadences and, when she chooses to, to wonderfully catch the inflection of those around her. She also has eyes to bear witness, with an illuminating humility and compassion. At her best she catches us up short, takes us out of ourselves, and makes us hear and see how it is with herself and with others in this life. In her 48th year, in 1981, Ann Yarmal, joined the United States Peace Corps and was assigned to the Senior Staff, as a librarian for the Windward Island Banana Research Center in St. Lucia. While in St. Lucia she also volunteered to work with the St. Lucia Blind Welfare Association, Victoria Hospital, and Central Library. Her home was in the countryside where she helped to raise chickens as a pilot project, through mini-grants obtained for members of the Blind Welfare Association Workshop. 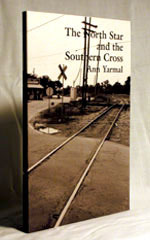 Prior to this Peace Corps experience, while obtaining a Library Degree at Columbia University, Yarmal had the opportunity to study with poet, Hugh Seidman. She later produced Poetry in Connecticut, a program of interviews with Connecticut poets and publishers for Valley Cable Television in Seymour and appeared as a guest poet on Art Week, Connecticut Public TV. Her work has appeared in an anthology of Fairfield County poets, On This Crust of Earth, and The Connecticut River Review. She was a consultant and coordinator for “The Poet’s Voice”, a Fairfield County poetry program, and began a drop-in program for poetry, “PoemAlley” at the Unitarian Universalist Society in Stamford in 1998. “PoemAlley” continues to meet each month in Stamford, Ct.